Vyalone is a prolific Los Angeles-based artist who specializes in colorful faces with prominent features. Vyalone is a prolific Los Angeles-based artist who specializes in colorful faces with prominent features. In his works, eyes can be menacing or fearful while noses seem to be caught in mid-smell. The bright blues and vibrant greens of his palette make the figures pop and Vyalone’s attention to detail brings the aerosol to life. WHAT: When your canvas is moveable you have a large and consistently growing audience. But painting on cars and trucks is no easy feat and there’s no room for error. 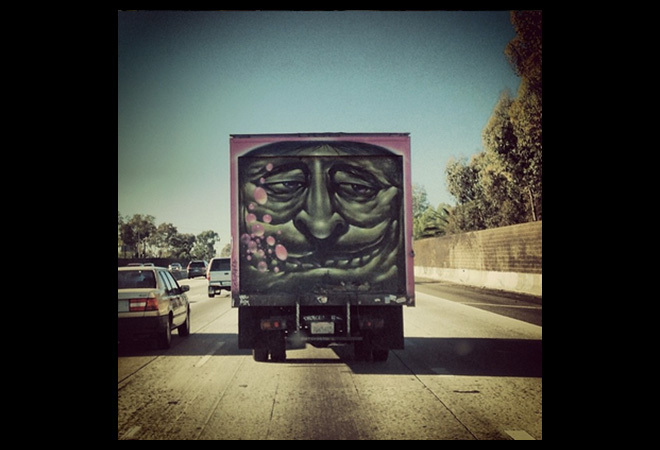 We spotted this truck heading west on the 10 and days earlier driving north on the 405. When traffic is at a standstill, these eyes watch your every move. WHO: Vyalone’s work has graced walls all over Los Angeles. When we got in touch with him, he promised us that he has great things up his sleeve for 2014. Keep your eyes peeled.